In “Moonblindness and the Paleness of Dust,” the author Jack Rickard brings his childhood adventures in the American West to life. Growing up on a farm in Kingman, Kansas during the 40s and 50s, afforded him this opportunity. Written in vivid detail, readers will feel like they are actually there in person watching his life unfold. Raised in an environment without any frills, Jack grows up living off what the land offers. This includes experiencing natural disasters like plagues, blizzards, and tornadoes. He experiences real life adventures. His eccentric relatives make this memoir even more interesting. He shares tales about his uncle Buck who was probably the biggest character of them all. Getting involved in athletics in high school was a life changing experience for Jack. Movies and dances also opened up a different world. Through the theater, he was able to see the world from a different perspective that gave him an understanding of how different things were in other places. In some ways, it also made his small town seem inadequate. In reality, in spite of the hardships, growing up during the Depression, outside of the boundaries and restraints of city life, was probably a richer experience. Life lessons about survival in this coming of age memoir are definitely learned. As a reader, I found myself totally caught up in his vividly described experiences. It also made me appreciate that my living situation enables me to be able to read about these adventures through someone else’s eyes, rather than experience them for myself! 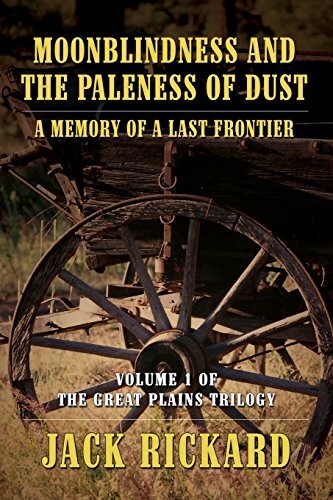 "Moonblindness and the Paleness of Dust" is the first volume of The Great Plains Trilogy. Highly entertaining and enriching, readers will be eager for the continuation of Jack’s story in the following installments.